Material : WCB, CF8M, CF8, CF3M, SS317L, Hastealloy 'C' etc. Material : CI, SGI, WC8, CF8, CF8M, CF3, CF3M etc. Material : WCB, CF8, CF8M, CF3, CF3M etc. Material : CI, WCB, CF8M, CF3M, CF3, A-20 etc. Ends : Screwed Female / Male Ends. Leakage: 100% Tight Shut off. Class VI Leakage. Size Range : 1/2" to 12"
Size Range : 1/4" to 6 "
Media : Air,water,Oils,Gas Vaccum etc. Size Range : 1/2" to 3 "
Radiator Valves are used to connect the radiators to the transformers. They are generally kept in a closed position when the transformer is not in use or radiator is removed for servicing. It is kept in the on position when the transformer is working. Our flap has an Angular Flat edge as compared to the conventional V shape having line contact only with the valve body. Flat edge ensures almost zero leakage. 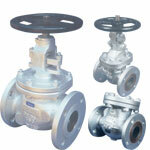 Shell moulded, shot blasted and fettled CI casting (IS-210, Grade 200) for zero body leakage and better finish. Streamlined Flap design minimizes frictional resistance to fluid flow. No rubber lining, yet leak proof. Valve is able to look in "OPEN" and "SHUT" position by cap. They are used to remove moisture and dust partiles from the air entering the conservator tank of the transformer. The sole function of the silica gel breather is to remove the moisture and dust particles from the air entering the conservator tank of the transformer. Gel removing and refilling method is specially designed to avoid skilled labor requirement at Site to replace the gel. Full body made out of Aluminium LM-6 Die Casting for zero leakage and better finish. 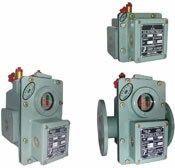 Magnets are placed in a special manner to ensure complete synchronization in thier movement. The Buchholz Relay is one of the most essential protective devices to protect equipments such as transformer, Capacitors, On Load Tap changers etc. The Buchholz relay detects abnormal working of the components inside the equipment and consequently minimizes the spread of any damage to the equipments active part by disconnecting faulty apparatus before large scale damage occours to the the apparatus or other connected apparatus. 1. To protect the equipment against electrical fault by giving alarm or tripping the equipment. 2. To the type and the cause of the fault. Fabricated Leak proof MS Sheet Body like transformer body. No need to treat for porosity like castings body where micro cracks may give rise to leakage at any time. Bucket design instead of float type design to avoid leakage in float. Built in Test facility for checking continuity of both the alarm and the trip circuits. UV Proof powder coated body with seven tank hot phosphating cleaning process for longer body life. © Copyright 2010 Perfect Engineering. All rights reserved.